John Evans is widely known by his collaboration with David Sanborn on his album Hideaway. Evans composed and co-penned Creeper with Sanborn. Last year I reviewed his album The Winding Road (2009). Now he is back with his new album Postcard from the Moon (2010). All songs are composed and arranged by John Evans. Keyboardist John Evans is joined on this album by his band Dream, Ron Jones (saxophones & flute), Larry Spencer (trumpet & flugelhorn), Brady Mosher (guitars), Johnny Hooper (guitars), John Evans (keyboards), Chuck Rainey (Fender bass), Gene Glover (congas & percussion), Mike Collier (drums & vocals), Jennifer Perryman (vocals), Rosana Eckert (vocals), Annagrey Labasse (vocals) and new Andy Timmons (guitar). The album starts with the ballad You Never Taught Me How To Say Goodbye. The heartfelt song about the lost of a beloved person features lovely singer Jennifer Perryman. The horn arrangement borrows from Earth, Wind & Fire, the vocal arrangement from the Carpenters, a delightful mixture. Sloppy Joe's touches the Latin string. Excellent the rhythm section and especially Larry Spencer on trumpet. Emilio reminds me of Harry Bellafonte's Island In The Sun. Yes, that is the swing of the '50's and still standing the test of time. On Bronx Blue you can listen to heavy blues intonations with Ron Jones on featured tenor sax and Andy Timmons on guitar. Walking along 7th Avenue we arrived contemporary jazz with jazz rock elements. Postcard From The Moon presents the terrific singer Rosana Eckert, who perfectly fits into the horn arrangement. Really impressive. 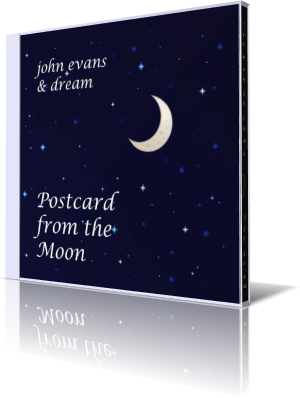 John Evans has a special offer for you: All three John Evans & Dream CDs for just $14.99. When you like his retro style, then this a very rare opportunity to buy something worthy for your collection!